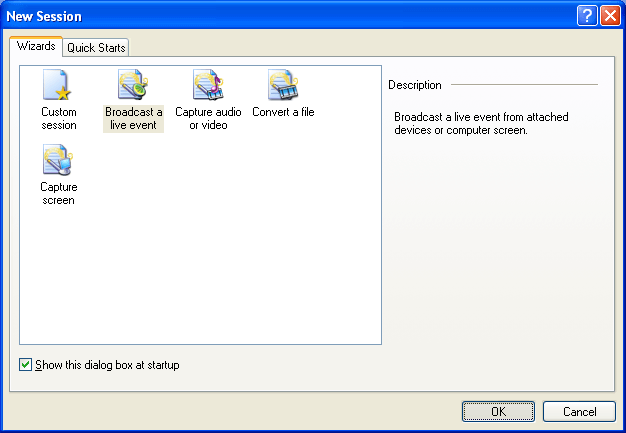 Using Microsoft’s free tool Windows Media Encoder and an Epiphan video grabber, it’s simple to live stream DVI, HDMI™ or VGA sources. 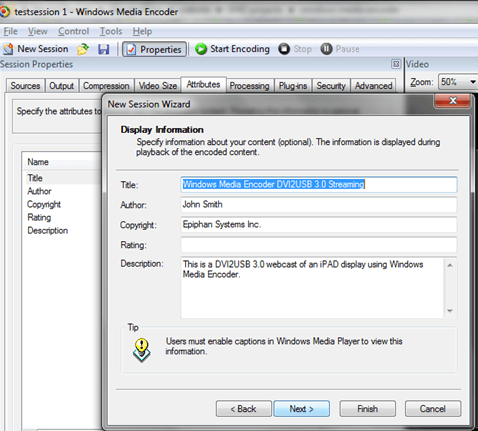 Step 1: Connect the Epiphan video grabber and start Windows Media Encoder. 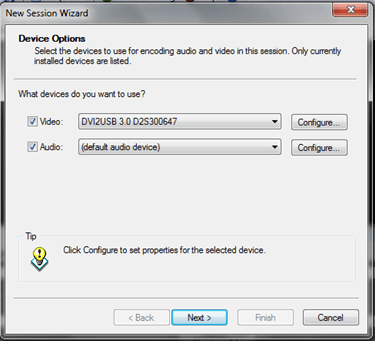 In this example, DVI2USB 3.0 is selected from the drop down menu and Tick the “Video” check box has been selected. Other frame grabbers (e.g. DVI2PCIe Duo and AV.io HD) may also be chosen from the dropdown menu. Select the port that you would like to use for connections. If you are not sure what port you would like to use, click on “Find Free Port”. Copy the URLs, you will need to give one of them to your clients in order for them to connect to your live broadcast. Click “Next”. 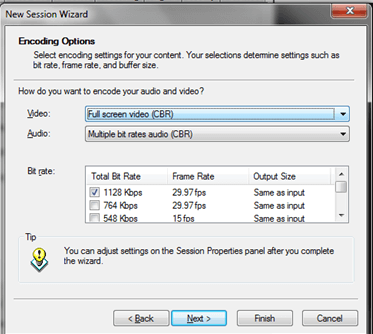 Select “Full screen video (CBR)” from the drop-down menu and make sure that the “1000 Kbps “is checked in the total bit rate column. If you would like to save your broadcast locally for later viewing, you must select “Archive a copy of the broadcast to file:” and choose a location for it. Click “Next” to proceed. 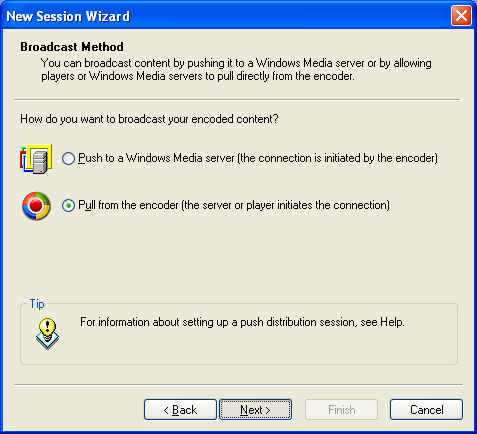 In this screen, you can configure information that people watching your video will see in the Title, Author, and Copyright fields in Windows Media Player. You may leave it blank if you wish. Click “Next” once you have completed this info. WM Encoder will display a review of all the settings. 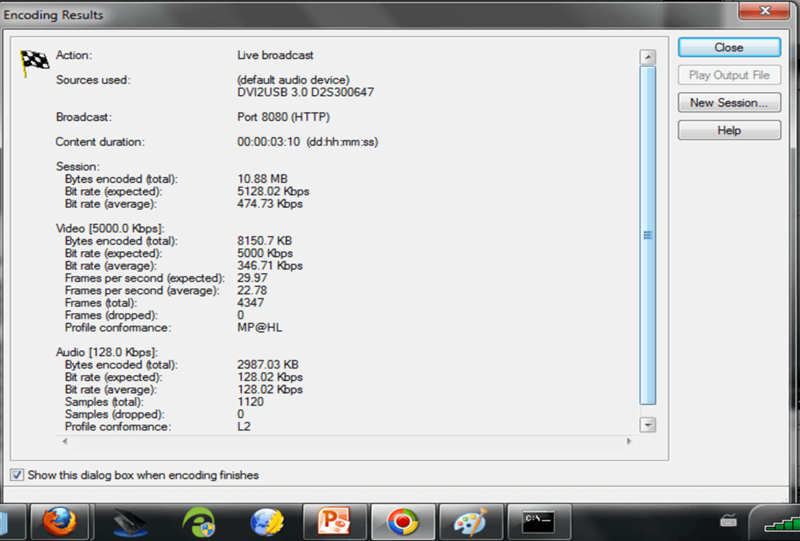 Click Begin broadcasting when I click Finish, then click on “Finish” to finalize the configuration. You will now be brought back to the main WM Encoder screen. 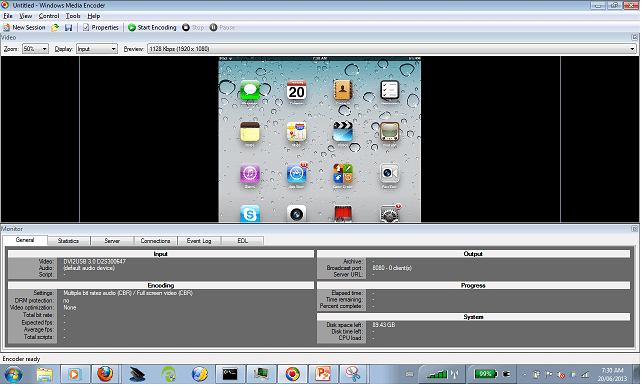 You will see your video output from the Epiphan Frame Grabber. Congratulations! 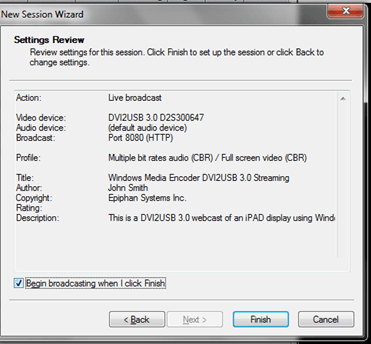 You’ve just made a local Windows Media broadcast using an Epiphan video grabber. 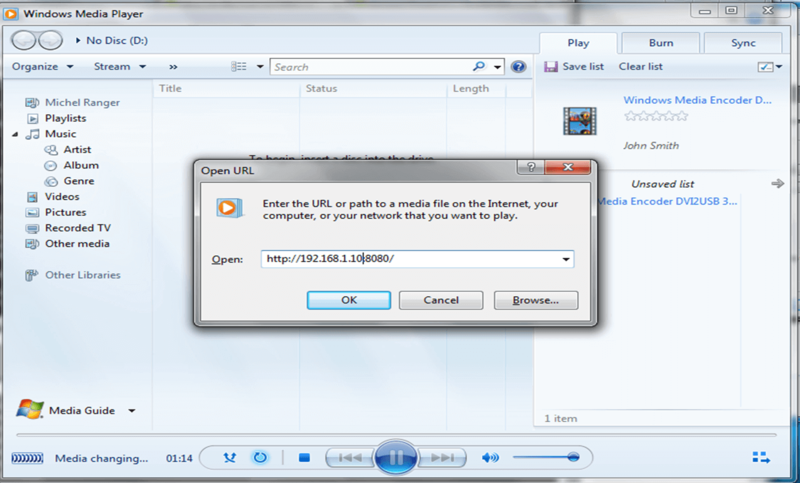 Open the media stream using a Media Player to the URL established in earlier steps. 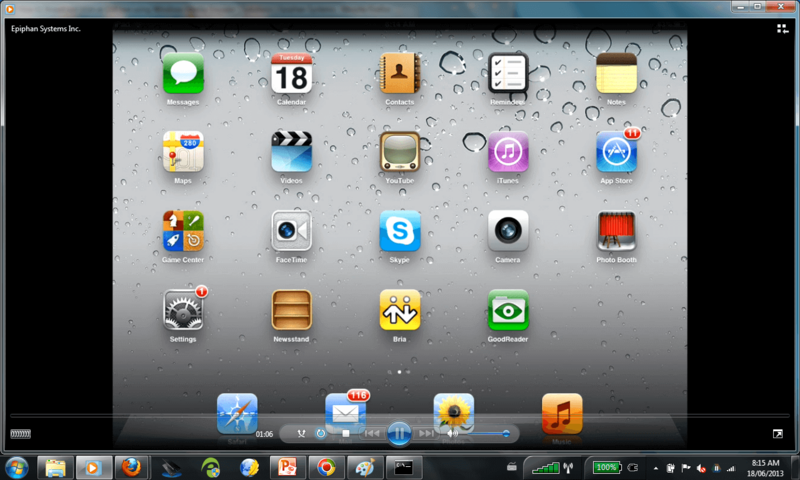 You will now see the live stream of the source iPad display for this example as shown below. Notice the branding meta data we programmed earlier that is shown in the top left hand corner of the media stream. Hint: Quality of video not sufficient. 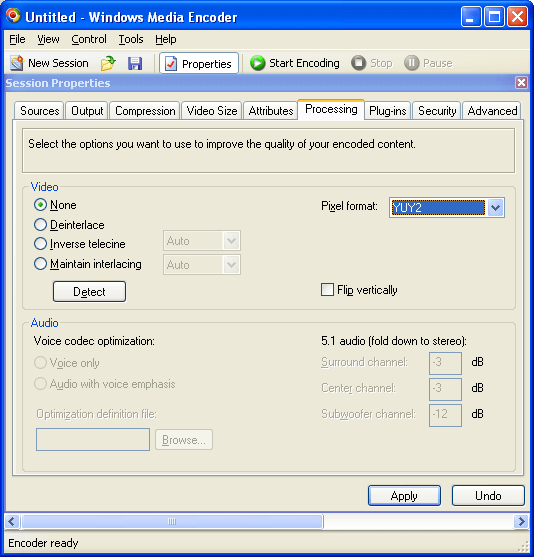 Windows Media encoder provides a number settings and parameters to tune the quality vs. bandwidth trade offs for your application. The status panels show you CPU usage, disk space usage, etc. If your video quality from the WM Encoder is not sufficient, try stopping your recording and going into the “Properties” button found at the top of the window. From there, go into the “Processing” tab and select “YUY2” from the “Pixel format” drop-down list. Other options such as changing encoders, bit rates, etc. is also possible.